Old map by ANTIPHONARIUM - Leaf on vellum from an antiphonary. 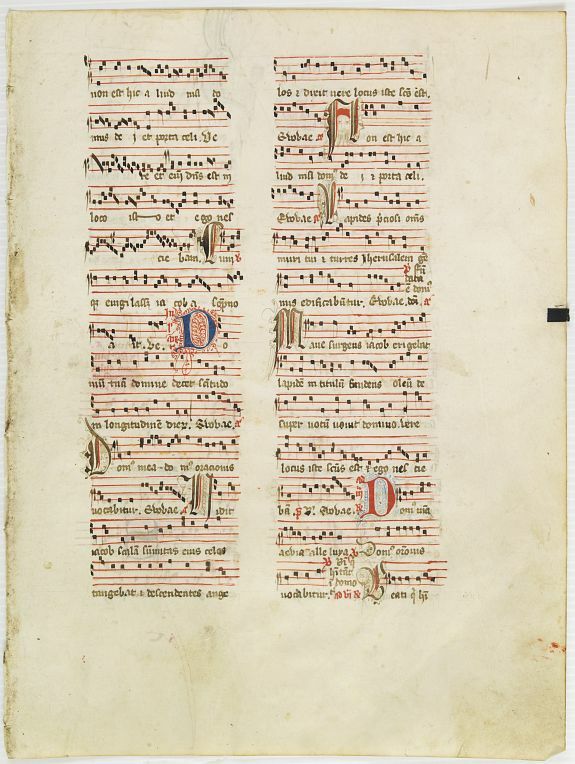 Title: Leaf on vellum from an antiphonary. Size: 11.5 x 8.7 inches. Condition: 13 lines in dark brown, written in two columns. Upper margin cropped, shaving the marginal initial, generally in fine condition. 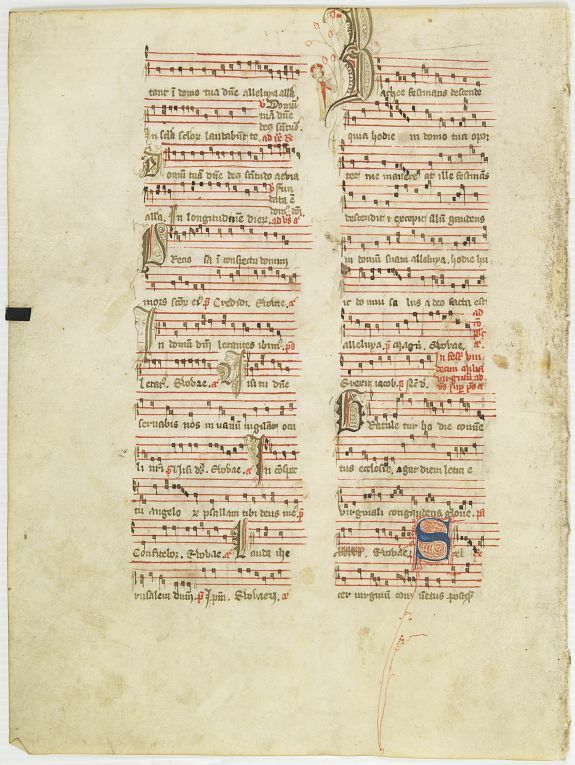 A more than 600 years old antiphonary leaf, written in Besancon, in 1370. Musical notation on 4 bars, the staves are in red and the notes in black: numerous pen-flourished initials in brown with red flourishing almost each initial decorated with human heads. Several 1-line initials in brown and red ink. RECTO: One line initial T with extensive pinwork in blue and red. In top a historiated initial with human figures. Besançon, was the capital of the department of Doubs and the former capital of Franche-Comté which has since been merged with Burgundy to become Burgundy-Franche-Comté. Paris was a leading city in the production of illuminated manuscripts throughout the Middle Ages; however production plummeted in the early years of the fifteenth century as a result of multiple difficulties; including the plague, the fall of the city to the English and the Burgundian-Armagnac feud. The fifteenth century thus saw a rise in manuscript production in provincial centers; particularly in Burgundy and the neighboring Franche-Comté owing to the artistic patronage of the Dukes of Burgundy.